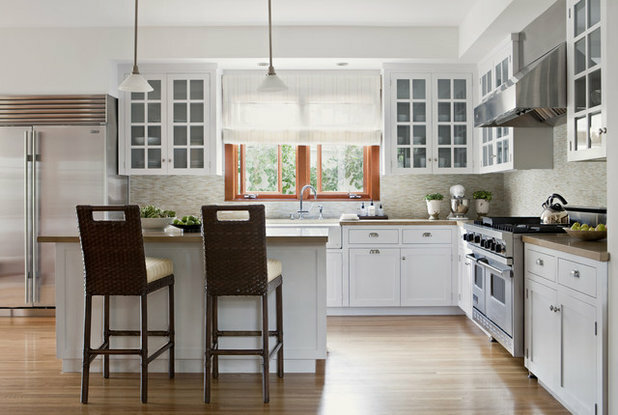 If you’re remodeling your kitchen or designing a new one, your first order of business is choosing a layout. Do you want open or closed concept? Does the standard work triangle best suit your cooking style, or will work zones make food prep and cleanup more efficient for you? Do you want a design with storage room to spare? Only you can answer these questions, but one thing is clear: Your layout determines the way you cook, socialize and entertain. Here’s the skinny on three common layouts to help you pick a winner. 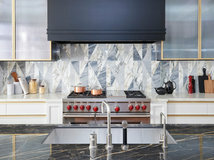 U-shaped kitchens are more common in older homes and smaller residences (such as apartments and townhomes), but you can also find them in modern builds. Pros: U-shaped kitchens utilize three walls or cabinet sections, so you’ll probably have good storage space relative to the size of your kitchen. Since your appliances will be closer together (especially in smaller kitchens), you won’t have to walk to the other side of your kitchen for food prep or cleanup. Last, some homeowners prefer closed kitchen designs, and a U-shaped design will keep the space separate from living and dining areas. 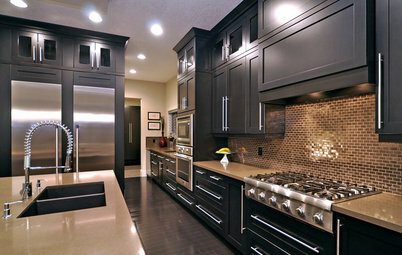 Cons: U-shaped kitchens often feel cramped because of how close your appliances are located to one another. As a result, you may not have enough room to operate during meal prep, and cooking may not be a functional process for you. Cabinetry isn’t always easy to access due to corners. An island is usually out of the question. 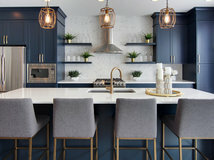 Yes, some homeowners prefer closed-off kitchen spaces, but many homebuyers want an open-concept design, especially in today’s housing market. Many U-shaped kitchens can feel isolated from the rest of your home’s living space. 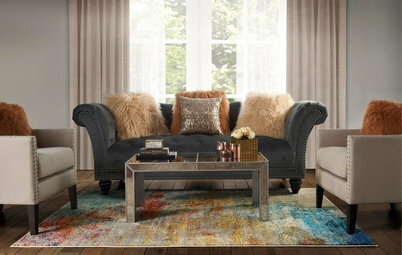 Large designs will have a spread-out work triangle, which can be an inconvenience. 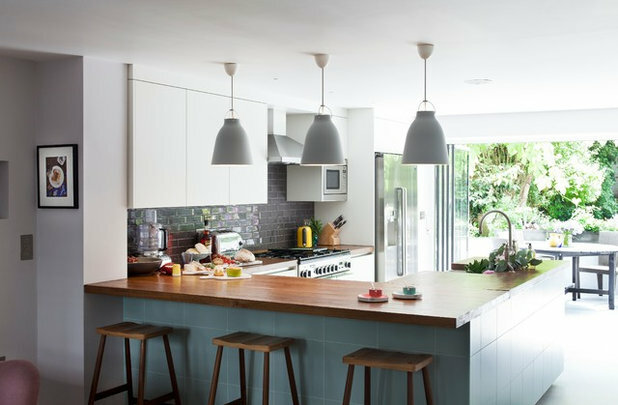 If you’re looking for ways to turn your U-shaped kitchen into an open-concept design, knocking down a wall can do just that. You can create a peninsula with bar-style seating once the wall is removed and then feel connected to adjacent spaces. You may also be able to knock down two of your existing walls or design a U-shaped kitchen with only one full-height wall. 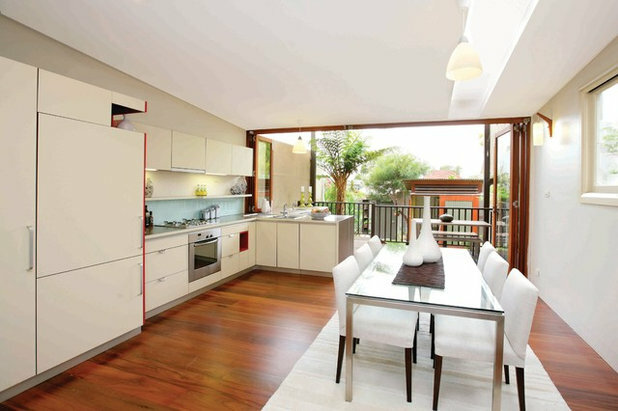 This contemporary kitchen offers a fully functional cooking space that’s also well-equipped for entertaining. 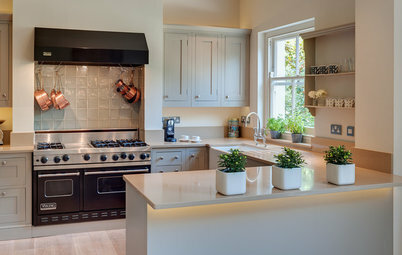 Some U-shaped kitchens are large enough to host an island. Walkways between cabinetry must be at least 36 inches wide, so one of your kitchen walls must span at least 12 feet to fit a 24-inch deep island. 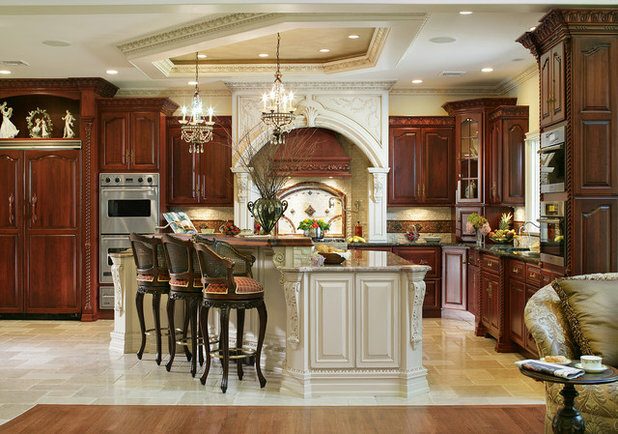 These types of kitchen layouts use two walls or sections of cabinetry, forming an L. They usually include an island in the middle. 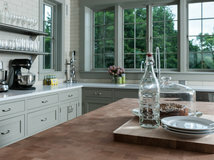 Pros: L-shaped kitchens provide the consummate open-concept cooking experience. 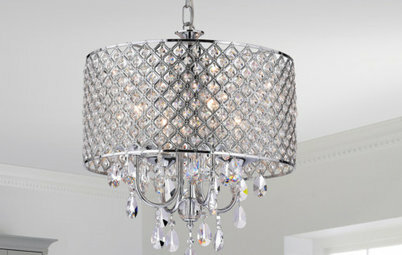 They’re ideal for entertaining and socializing, and can transform your kitchen into the true hub of the home. 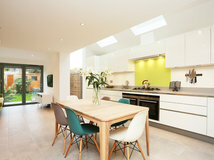 If we take layouts at face value, L-shaped kitchens are the most island-friendly layout because of how spacious they are. 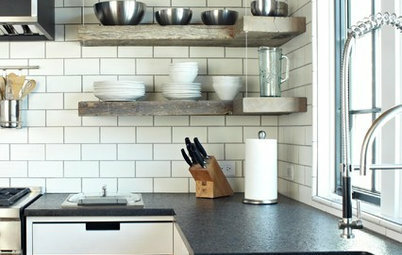 They have sufficient counter and storage space when they include an island. You can also better opt for work zones instead of the traditional work triangle in L-shaped kitchens. Cons: You almost always need an island to ensure that you have enough workspace. This added expense may not suit your budget. An island may not suit your cooking style either. The work triangle is more spread out in L-shaped kitchens. While some homeowners appreciate the space, others will grow tired of walking back and forth between their stove, sink and refrigerator. There’s usually more to clean. 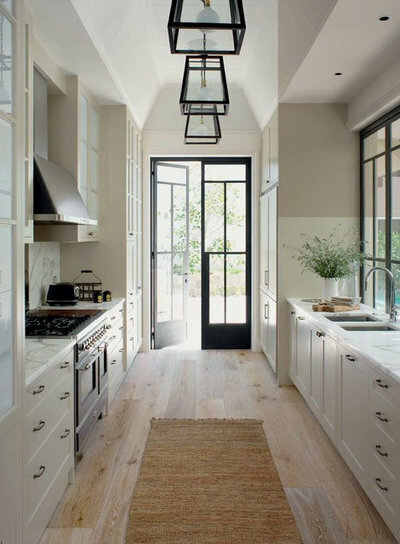 L-shaped kitchens often require more finishing material, and they can carry a higher price tag than galley kitchens and small U-shaped kitchens. L-shaped kitchens don’t always need an island. 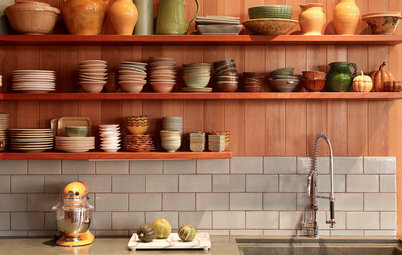 For some homeowners, less is more when it comes to cabinetry. 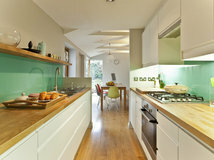 You can also open up one of the walls in your L-shaped design, as this contemporary kitchen does. You can also double up on storage and prep space by designing an L-shaped island. 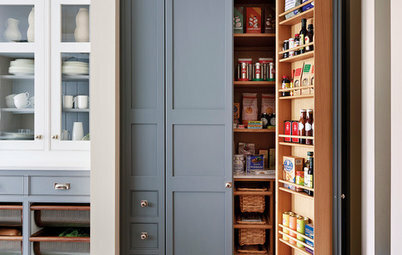 A galley kitchen has one pass-through between two sections of cabinetry. These sections may be composed of closed walls, partially open walls or an island. Pros: Galley kitchens maximize space and make for efficient cooking zones. Your appliances are organized and easily accessible. They offer versatility to homeowners. They can be open or closed concept. They can take advantage of limited space you may already have or save space when you’re designing a new home. 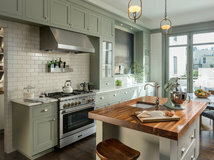 Galley kitchens tend to be smaller; you won’t have to spend a fortune on finishing materials like cabinets, countertops and backsplashes, nor will you spend a lot of time cleaning up. Cabinetry is fully functional and accessible. Cons: On the flip side, the smaller size can be a drawback. 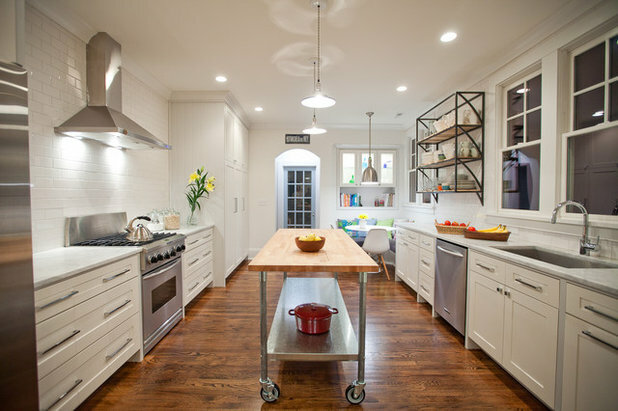 If you want a supersize kitchen with ample storage and counter space, you may not find a galley design sufficient. 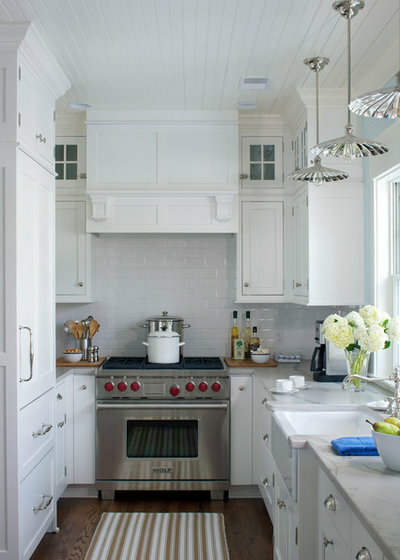 Particularly, upper cabinetry can be limited in some designs. If you’re designing a new home and considering a galley kitchen, you may not have room to expand 10 years down the road. 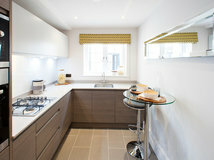 Galley kitchens don’t have to be closed concept. 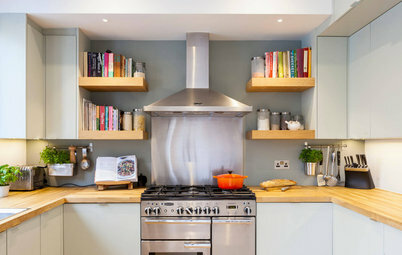 You can open up one of your galley kitchen’s walls to provide additional seating space and connect the space to the rest of your home. 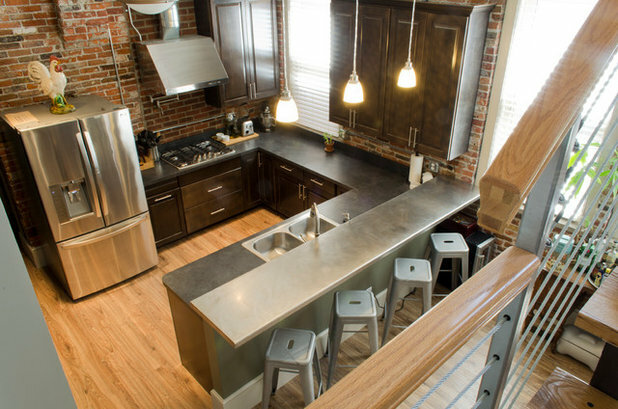 A small island, whether it’s built in or on wheels, can add storage and prep space to a galley kitchen. Just make sure you leave enough room to comfortably navigate around it. 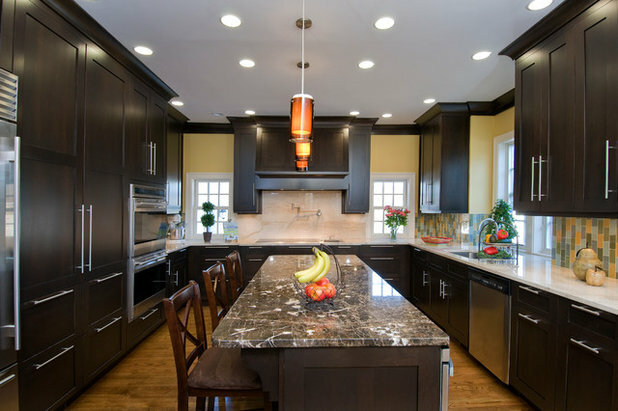 A more modern rendition of the galley kitchen features one wall of cabinetry with an island. 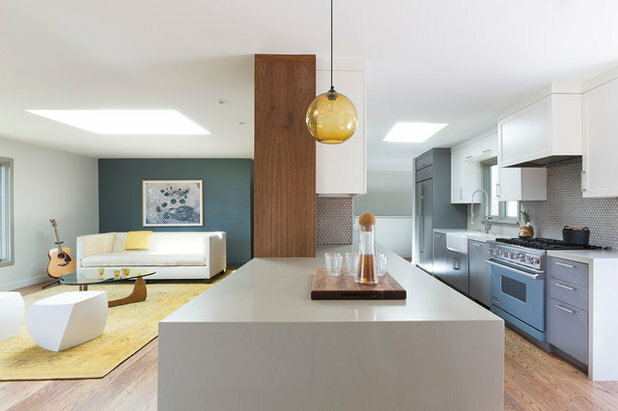 This type of galley kitchen is your best bet for an open-concept design. I have a layout that is not discussed here. A G shaped kitchen. It is small with a built in island at one end looking into a large dining room or great room . It is big. I love the fact that stove , sink , and fridge are close so when cooking everything is right there, but not a lot of room for more than two people at one time. The breakfast bar drops down so two people can sit there and where we eat most of the time. My home was built in the 40's so not much can be done to enlarge but house is great for two people and a dog. We do manage to get about 30 people in here during our Christmas gathering. Put a long table up against the breakfast bar and use island also for buffet. People whp "spare no expense" or who are willing to up their mortgage to have a "desgner kitchen" may choose to reinvent the wheel, however, most of us work within the bounds of the home we chose in the first place to fit the bdget and lifestyle we can live comfortably. 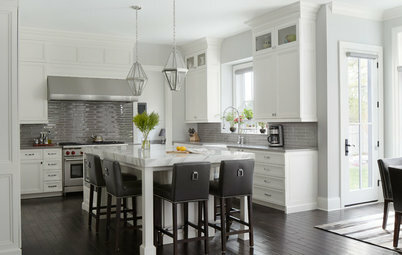 I love to see the way homeowners imaginations create real-life workable kitchen they and their familys can enjoy!